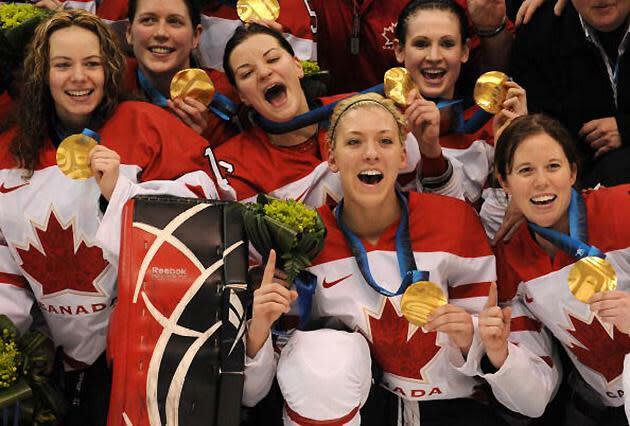 SOCHI, Russia – How dominating are the U.S. and Canadian women’s hockey teams? Consider that the U.S. won the first Olympic gold in women’s hockey in 1998, followed by three Canadian victories. The lone final that didn’t have both teams was in 2006 in Turin, when Sweden won silver and the U.S. captured bronze. Consider that in the Vancouver Olympics, the U.S. and Canada defeated their six preliminary round rivals by a combined scored of 72-3. Consider that because of their supremacy, the International Ice Hockey Federation reinvented its tournament format to avoid having teams’ spirits crushed as badly as they were crushed on the scoreboard. The U.S. and Canada literally forced the Olympics to rearrange its tournament, for them. Recognizing how self-defeating it would be to place its best teams in a “group of death," the IIHF essentially formalized what we all knew anyway: That the preliminaries are a cake-walk for the tournament’s best teams. So the four teams in Group A are already qualified for the medal round; the prelims are for seeding purposes, with Canada and the U.S. the top two teams getting a bye through to the semifinals. The top two teams from Group B face the other two teams from Group A in the quarterfinals of the medal round, with a royal arse-smashing awaiting them in the penultimate games. “I think it’s great,” said U.S. women’s coach Katey Stone of the format change, after he team's first practice in Sochi on Monday. “It’s great for the game, it’s great for the spectators. Obviously, you come to an Olympic event and you want to play the best competition you can when you put on the jersey. The IOC had made noise after the Vancouver Games about women’s hockey and its viability as an Olympic sport, considering how the scales tipped so dramatically in the elite teams’ favor. “We cannot continue without improvement,” said Jacques Rogge, head of the IOC. The IIHF reacted with a $2.1-million plan to increase participation in the women’s game around the world. One way to encourage that: Give weaker nations a taste of Olympic glory, even if it’s before they meet their inevitable end at the hands of the North American mega powers. Hence, the new tournament format was enacted for the 2012 world championships. The result? There were 10 one-goal games at that tournament, only two games with margins of victory greater than 10 goals and the Swiss medaled for the first time in their history. So it appears the format will be a way for teams like Japan and Russia to linger longer in contention, or simply play tighter games, than they would have under the previous format. More drama, better competition and a more compelling product; perhaps compelling enough to attract more players to the sport. But while this new format helps the lesser teams, it also creates a tougher road for the favorites. Julie Chu of the U.S. women’s team was unfazed by that. “We like the worlds format. The competition’s great. But it’s not something you can ever control,” she said.